Get ready! Get set! Go U-Pick! Can I Just Come Over Anytime and Pick Strawberries? Appointments are by reservation only. Please call ahead to make your reservations. 217-386-2690. You can also email: Helen@MulberryLaneFarm.com. What are the Prices This Year? A minimum 5 lb purchase per adult is required. if accompanied by an adult over 18. 5 lbs is approx. 5 quarts. Yes, this is a great activity for families. Be sure to check the rules below before coming. Should I Bring My Own Containers? We have you pick in our pre-weighed containers. Once the berries are weighed and paid for, you should have your own containers to dump the berries into for bringing home. Ice cream buckets work well. We also sell buckets for a small fee, that holds 5 lbs of berries. When Will the Strawberries be Ready? They will be ready approximately around the end of April 2019. They should last about 4 -5 weeks depending on weather conditions. Is this a good one Mom? U-Pick is growing in popularity all across the country! You have the fun of taking your family out to Mulberry Lane Farm for a trip to the country, enjoying the fresh air and the quiet! 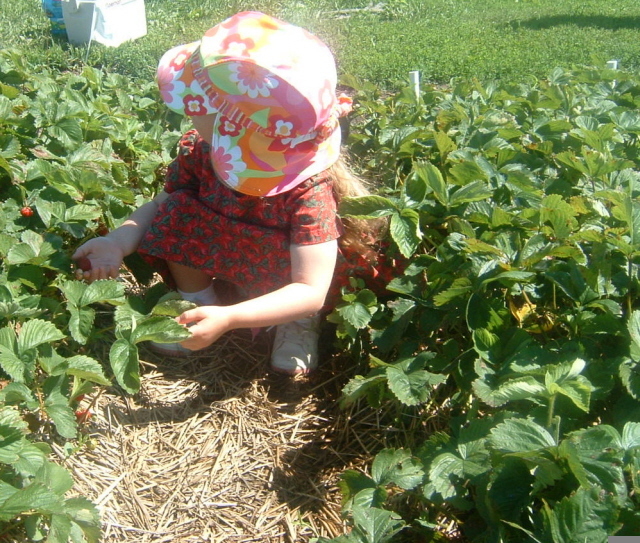 You can teach your children how the strawberry plants grow and what fresh-picked strawberries taste like! You get to pick only the ripe berries, making sure the strawberries are not overripe or underripe. You also save money by picking your own strawberries. Nothing is better than the sweet juicy taste of a freshly picked strawberry from Mulberry Lane Farm! We do not use any chemicals on our berries, so they are ready to eat straight out of the patch. 100% all natural berries! What Do I Need to Know Before I Come to Mulberry Lane Farm? There are a few rules that you need to be aware of and to follow when coming to Mulberry Lane Farm for U-Pick strawberries. Rules work for the benefit of all and help us continue to offer you top quality U-Pick Strawberries. 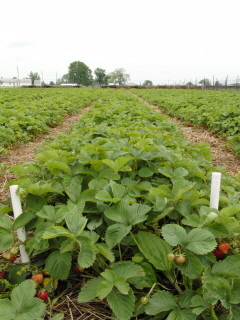 We do ask that you appreciate that Mulberry Lane Farm workers have worked hard planting, mulching, watering, and weeding the all natural strawberry plants to make the U-Pick Strawberries at Mulberry Lane Farm a good experience for all who attend. It is your responsibility to treat the plants with respect. We have found that the majority of folks coming for U-Pick at Mulberry Lane Farm are just amazing people and follow the rules to the letter. Thank you! There are the few who make it difficult for everyone. We really are reasonable and not hard to get along with but those who cannot follow the rules will be asked to leave by the field supervisor. Minimum charge: 5 pounds (approx. 5 quarts of berries) for every person going into the field; includes children 12 years and over. You are NOT allowed into the field unless you have pre-paid for 5 pounds. For example, if you have one person coming to pick, you will be charged for a minimum of 4 pounds of strawberries, even if you don't pick 5 pounds. If you have one parent and one child over 12 years of age picking in the Mulberry Lane Farm U-Pick Strawberry field, you will need to pay the minimum charge for 10 pounds of strawberries, even if you don't pick 10 pounds. If you have one adult and two children over 12 years of age, you will be charged a minimum of 15 pounds of strawberries, even if you don't pick 15 pounds. is a great time to come. Bring coolers with ice packs if you plan on picking for more than an hour or two or if it is a very hot day. Light-colored, cool, loose fitting, cotton clothes. No pets allowed in the fenced area of Mulberry Lane Farm U-Pick Strawberries. If you must bring your pets, please leave your pets in your vehicle so that other customers can come into our parking lot without fear. Bad attitudes regarding the rules of Mulberry Lane Farm U-Pick strawberries. Thank you for NOT SMOKING on the farm grounds of Mulberry Lane Farm U-Pick Strawberries. In addition to air pollution, this can also be a fire hazard on the dry straw and grass. You may smoke outside of the fenced areas. Please pick up after yourself out of consideration for other customers. Radios, stereos, or any other items that will disturb your neighbors. One of the comments we frequently hear from our customers is how quiet it is on the farm. Please help us maintain that atmosphere. Mulberry Lane Farm all natural strawberries are grown without any chemical fertilizers, herbicides or pesticides. (Did you know that the some U Pick strawberry patches that are not all natural may spray as little as 24 hours before you go to their farm to pick and eat them?) We do all the labor by hand rather than spraying poisons on the strawberries you will then eventually eat. That means hours of back breaking weeding, hand fertilizing with leaves and compost. We do all of this work because we think the strawberries taste so much better without all the oil based chemicals on them. Our own family eats out of our garden and we want healthy, clean food and we know you do too. We care about our health and we care about your health---and that is why we do what we do. Cash only. Due to the high cost of processing credit cards, we accept only cash. This helps keeps prices down on our produce. We have a rest room at Mulberry Lane Farm. 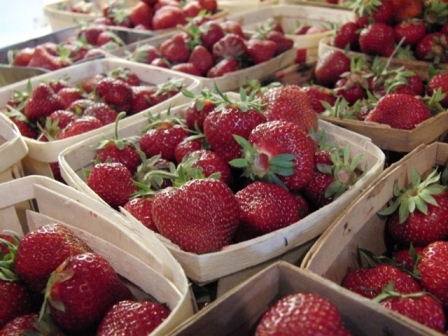 We have no designated area for picnics for large groups at Mulberry Lane Farm U-Pick Strawberries. There is a nice child-friendly park in Loda, 2 miles from Mulberry Lane Farm U-Pick strawberries. They have picnic tables and nice shade. Ask supervisor for directions. We prefer individuals and small family units. If you have a larger group more than 10 people, including children, please call the farm first, and we will schedule you in. We offer weed free, well strawed strawberry rows! When you arrive you sign a form letting you know that we are not liable for any accidents on our property and that you agree with our rules listed on the form. Mulberry Lane Farm is not responsible for injuries, damages, lost or stolen items, however caused. You then pay the minimum payment required for your group size. (This amount is subtracted from your total when you check out, if your berries weigh more than the minimum amount required for your group size.) If you are asked to leave because you are not following the Mulberry Lane Farm U-Pick Strawberry rules, no refunds will be given! Don't worry, we will give you fair warning first. So far we have never had to ask anyone to leave. Help us keep it that way! The field supervisor will show you where to start picking, quickly going over the rules. Please respect the field supervisor! Pick ONLY on the row assigned to you; the other rows are already reserved for other pickers. Please leave the adjacent rows for other pickers. As you pick, take special care to ensure that your feet or knees do not accidently damage the plants or the berries on them. If you would like to change rows, ask the supervisor. Use the containers provided by Mulberry Lane Farm as these are pre-weighed. Ice cream buckets work really well! You will start at an assigned section that is flagged. When you are finished picking, remove the flag where you started and put it in where you finished so you or the next person will know where to resume picking. Please walk in the aisles and paths not across the rows as this damages the strawberry plants and strawberries. There is to be no running in the field or jumping or stepping over strawberry rows or throwing of berries. Please do not EAT the berries while in the patch. Please pay for berries before eating or sampling. Same principles apply at Mulberry Lane Farm as in a grocery store. This way we can afford to keep supplying you with U-Pick strawberries next year! Thanks for helping to keep the small all natural family farm in business year after year! Pick ALL ripe berries of all shapes and sizes. Look a strawberry over before picking it. If the tip is still white, it is not as sweet and ripe as it can be; don't pick it. But if you do, it is yours. 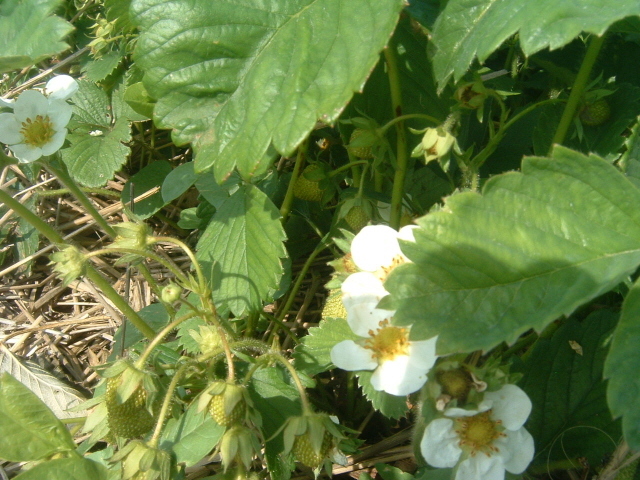 Look carefully under the leaves and along both edges of your row; strawberries like to hide. Please pick thoroughly, getting all the berries that are ripe, even the small ones (they actually taste the best!) One of the problems we have had in the past is some U-Pickers pick only the big berries and leave all the small ones. Supervisors will be checking as you pick, and point out if you are not picking all of the ripe berries. If you cannot co-operate with this policy, and have all the biggest strawberries in your baskets, you will be charged the top price for the berries you have picked (higher than regular U-Pick prices) and then asked to leave. Once berries are red, they do not become any larger. Ripe berries that are not harvested will spoil and rot, attracting flies and spreading berry diseases, and be wasted before we return to this area of the field. It greatly helps us and the next person who picks your row later if you remove berries that have bad spots, showing rot, sunburn, insect injury or other defects and place them in the baskets provided for that purpose. We give the rotten berries to our chickens. Keeping the rows free of rotten berries keeps the U-Pick costs down for everyone. Carefully place the strawberries into your containers. Do not pile your berries too high in your containers or the berries on the bottom may be crushed. When your containers are full, mark your spot with your flag and bring your strawberries back to our stand to be weighed. then the red tasty treat! The most comfortable way to pick is to squat or kneel. Do be careful not to smash the berry plants in the rows beside you. Strawberries are tender and bruise if they are squeezed. Be gentle! Leave the caps on the strawberries so that they will stay fresher longer. To pick with the stem, with the strawberry lightly in your hand, grasp the stem just above the berry and pull with a slight twist. When you have picked a bucket and still want to pick more, place your strawberries in the shade. We have several trees that you can put them under, or we can put them in our stand to watch them for you. Strawberries are sold by weight. A quart equals about 1-1/2 pounds of fresh berries. An ice cream buckets holds about 5 pounds of fresh strawberries. We will weigh the strawberries for you and calculate what you owe. We accept cash only. Picking early or late in the day, is best to avoid the heat and sun. Wear hats and sunscreen. Drink plenty of fluids if it is a hot day. We do have drinks for sale at our stand, if you wish. Berries to be used immediately may be picked any time, but if you plan to hold the fruit for a few days, try to pick in the early morning or on cool, cloudy days. Berries picked during the heat of the day become soft, are easily bruised and will not keep well. Cool your U-Pick strawberries as soon as possible after picking. Strawberries may be kept fresh in the refrigerator for three or more days, depending upon the initial quality of the berry. After a few days in storage, however, the fruit loses its bright color and fresh flavor. Plan on picking on a day that you can also do them up. 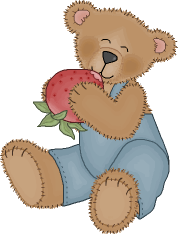 Put your feet up and ponder the memories of your special U-Pick strawberry day at Mulberry Lane Farm! Yummy! Treat your guests to FRESH picked strawberries! Use strawberries as soon after harvesting or purchasing as possible. Refrigerator storage does not improve the quality of fresh strawberries. Berries should not be left at room temperature for more than a few hours. Warm temperatures cause a browning effect in strawberries. The pigments that make strawberries red, anthocyanin, are heat sensitive. They break apart and turn brown when exposed to heat. 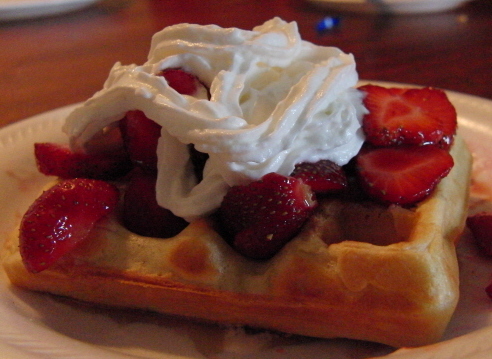 Strawberries also lose heat-sensitive Vitamin C during browning, heating and cooking. To wash, place berries in a colander and rinse under cold running water. Do not allow berries to sit in water as they will lose color and flavor. Mix cake according to package instructions. Grease and flour 9x13-inch cake pan. Layer approx. 1 cup or more of coconut on bottom of pan. Pour 1/2 of the mixed cake batter over the coconut. Cream together the cream cheese, powdered sugar, and 1 cup mashed fresh strawberries. Drop cream cheese mixture in large dollops over cake mix. Pour remaining half of cake mix over top. Bake at 350 degrees for 28-30 minutes. Do not over bake. Sweetened fresh strawberries can be poured over top as desired. Blanch the water chestnuts for 2 minutes in boiling water and immediately refresh in cold water. Combine with greens and shallots. Add oil and toss. Add vinegar, salt and pepper. Add fruit and gently toss again. Mix flour, sugar, cinnamon, salt and baking soda in a large bowl. Add eggs, oil and sliced strawberries with juice and blend well. Fold in walnuts. Do not use a mixer. Pour into 2 greased and floured loaf pans. Bake at 350 degrees for 50-60 minutes. Set aside several Mulberry Lane Farm strawberries for garnish. Puree remaining strawberries in a blender; strain into a pitcher. Stir in tea, sugar and lemon juice until sugar dissolves. Chill. Serve over ice; garnish with fresh Mulberry Lane Farm strawberries. Can't you just taste 'em? Blend cream cheese and sugar. Beat in yogurt and crushed strawberries. Refrigerate until serving time. 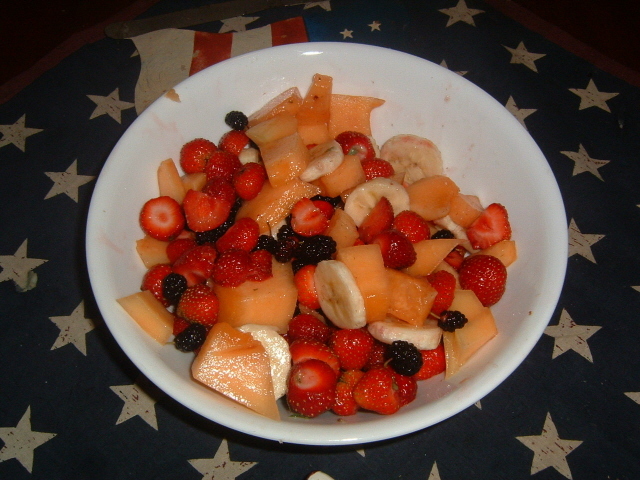 Serve with fresh sliced fruit and berries. Put all ingredients in blender. Cover and blend until smooth. Serve at once. Serves 2.